Was well-pleasing to God who was crucified. Saint Gemellos lived during the reign of Emperor Julian the Apostate (361-363), and was from the city of Ancyra, from the town known as Klimaxine. When Julian passed through the city of Ancyra, the Saint stood before his face, wounding him with inspired words that pierced him like arrows. The emperor became enraged, and ordered for the Saint to be girded with a red-hot iron belt. He was so badly burned by this, that the liquid seeping from his burning flesh covered the entire ground. 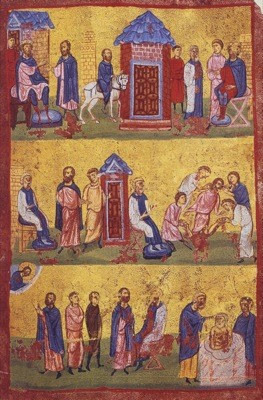 Gemellos was then ordered by the impious apostate to accompany him to the small city of Edessa. There he was stretched out, and the four limbs of his body were impaled with sharp wooden stakes. Then they pierced him throughout his body with hot irons, and he was torn at while he hung to a post. Because the athlete of Christ disdained the torments, and belittled the impious emperor, for this reason he was placed in a heated skillet full of oil, resin and lard. On top of this he was beaten with iron rods studded with spikes. However, by the power of God a fierce rain fell from the sky and extinguished the fire. Therefore the Martyr remained unharmed. Observing this the defiled emperor was confounded, and he ordered for steel spikes to be hammered into the skull of the Martyr, until they pierced through to his brain. Then the Saint was cast to the ground. After this they strung him up, and they flayed him like a sheep with a knife, from his legs to his shoulders. The brave contestant thus became a fearful and awful sight, because after these unendurable tortures he was still able to walk and converse with spectators. By the dispensation of God, the Saint encountered a Priest, and he was baptized by him, as he was still unbaptized. After he was baptized, he emerged from the sacred font completely healthy, without any wounds on his body. He then heard a divine voice from heaven say to him: "Blessed are you Gemellos, for your many labors." 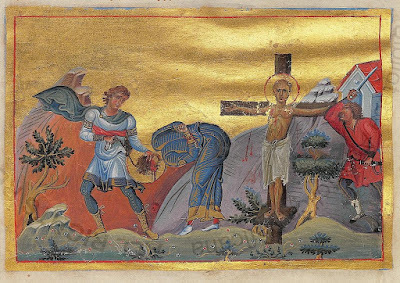 On learning this, the Apostate hung the Saint upon a cross, and nailed his hands and feet thereto. While hanging, the thrice-blessed one prayed, and he delivered his spirit into the hands of the Lord. Then some Christians secretly removed his honorable body from the cross, and they buried him in a chosen place.